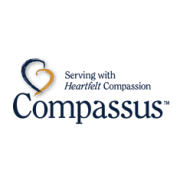 Compassus provides a compassionate network of highly trained professionals and volunteers who work together as a team to assess and meet our patients' and families' needs. Our team goes to great lengths to explore and evaluate treatment options in the context of each patient's symptoms, values, and wishes. Our primary goals are to provide the highest quality hospice care and service in every community in which we operate. If you are compassionate, caring, loving and have a calling to help others, becoming a hospice volunteer might be the perfect opportunity for you. Our volunteers give their time, talent and hearts generously and unselfishly - yet commonly feel that they receive more than they give. Compassus accepts donations. Donate Now.